Ironically, it is its size that both benefits and hinders Hitman. Taking an episodic format, the recent entry into the long-running Hitman series aims to deliver a AAA experience in a truncated, staggered envelope. The first episode achieves a massive scale in both setting and player agency, but that scale comes at the cost of long load times and poor performance. Though it aims to be big, yet condensed, Hitman unfortunately succumbs to its own weight and leaves you wanting more. Opening 20 years in the past, Hitman’s prologue follows Agent 47 through his training for the ICA, simulating the locations and circumstances of assassinations that former agents have conducted. Though sparse, and brief, Hitman’s prologue does well to give context and backstory to Agent 47’s murderous career, easing you into the game’s mechanics and introducing him to his longtime handler, Diana Burnwood — a staple character of previous games and a disembodied voice in this one. But it is the tentpole Parisian mission in which Hitman begins to lay its cards on table. Titled “Showstopper,” Hitman’s primary first mission takes place during the Sanguine fashion show at the Palais De Walewska in the heart of Paris, France. Agent 47 is tasked with the elimination of two targets: Viktor Novikov and Dahlia Margolis — two key figures of the criminal spy organization IAGO, specializing in the auctioned selling of government secrets. The De Walewska is a massive villa, facilitating enormous crowds and numerous contract-fulfilling opportunities. 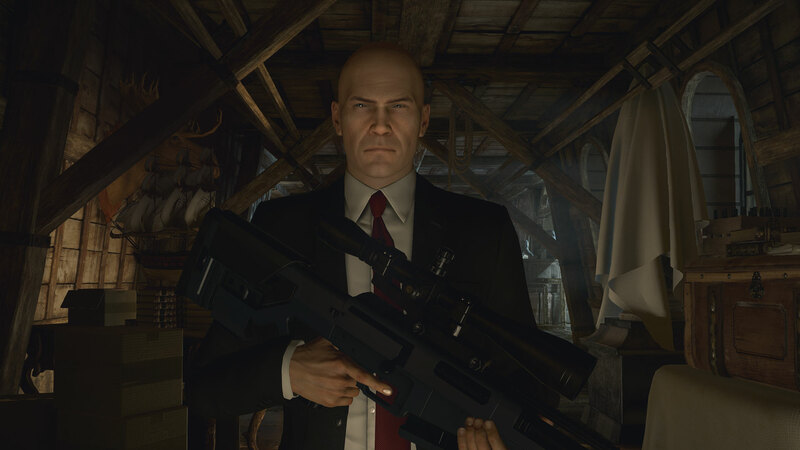 Being able to stalk his targets under the guise of a crowded room or place Agent 47’s cross-hair between a target’s eyes from 200 yards away gives missions a large sense of scale, as well as allowing for an impressive amount of player agency. The amount of opportunities the game provides you with is, at times, staggering. Combined with the large levels, the amount of unique opportunities Agent 47 can find across the level almost feels immeasurable. From the different disguises he can wear, to the different ways he can silently or gratuitously pacify his target — such as poisoning their drink or dropping an ornate light fixture upon their head — and even down to the small items littering the world that can he can weaponize, like letter openers and screwdrivers. When combining all these elements, Hitman’s Paris mission becomes clockwork, where several moving parts must come together in an intricate pattern to function properly and timing is everything. It can take well over an hour to take out the two targets and as each step brings you closer to success, so do they to failure. It’s tense, white-knuckled and immensely satisfying when all the pieces come together. But these large sandboxes and opportunities come at the cost of long load times that can hinder the tension and flow of a mission when having to load a previous stage due to dying or being caught. It became immensely frustrating having to sit through load screens that could run up to (and over) 30 seconds at a time when I wanted a second chance. Furthermore, the act of pausing often caused the game to chug or slow down as the screen loaded and the framerate often chugged under the weight of the level’s large size. Everything in Hitman comes at a cost, but it’s not always the right cost. While there is the typical cause-and-effect reactions to going into a situation loud and the attention that will draw, the game also faces you with unwanted effects, such as NPCs required to follow Agent 47 to a location, but disappearing when not in line of sight. This led to, at best, a lot of backtracking to find my wandering companion, and at worst, the opportunity I was pursuing failing. While the Paris mission is large, I felt myself, perhaps selfishly, wanting more from this first offering of Hitman. While my approach and actions were never the same, the setting always was. After nearly ten playthroughs of the mission, I began to know De Walewska’s halls and how to get to its best hiding spots. I even began remembering the paths guards would take, despite the large amount of them. I was able to take my targets out quicker during later playthroughs as I remembered where they would be and when. With this being the only big level currently available, I had no palate cleanser or alternate location to challenge myself with. At least at this time, this lack of content makes the first episode of Hitman feel like a one trick pony. That being said, there are several challenges contained in the Paris map that give Hitman a layer of replayability. In the main mission, there are two dozen different assassination options ranging from taking out the two targets with explosives to assassinating them both within 10 seconds of each other with a sniper rifle. These challenges reward players with different loadout and mission start options. The game also has a “Featured Contract” mode that tasks Agent 47 with taking out two random NPCs on the map, and an “Escalation” mode that selects a target and increases in difficulty with each playthrough, adding different objectives to complete. While these added objectives add to the game’s replayability, the level’s predictability once again becomes an issue, as everything in the environment stays the same and just the target changes. You may be hunting a new person in a new location, but everything around you is just as it has always been. Hitman tries an interesting balance of stuffing a lot into a little, but doesn’t exactly pull it off with elegance. While levels are large sandboxes containing numerous death-fulfilling opportunities, they come with the extra baggage of lackluster technical performance. Without the option of going to different locations of an equal size, Hitman currently feels like a product that lacks in its offering once enemy patterns and building layouts have been memorized.